Boxing Insider Notebook: Atlantic City, Khan, Crawford, Judah, WBC, and more.. The following is the Boxing Insider notebook for the week of April 9th to April 16th; covering the comings and goings in the sport of boxing that you might have missed. Boxing superstar Amir Khan and online financial trading broker ThinkMarkets have confirmed their first partnerships as part of the ‘Ring the Changes’ initiatives aimed at providing support and opportunities for under-privileged young people across the UK. More than 35 young people have been murdered in London already this year and Khan will work with ThinkMarkets and charity partners to raise funds and support initiatives to help young children get off the streets using financial education and the power of boxing. The London Institute of Banking & Finance will offer young people access to their Lessons in Financial Education (LiFE) course to teach young people about the world of finance. Amir Khan will be actively working with ThinkMarkets to reach out to boxing clubs across London to invite young people on to the programme. Youth Employment UK is not for profit organisation that helps 14-24-year-olds to kick-start their careers and will provide support specifically through their Young Professional programme which helps young people develop the work ready skills that employers are looking for. This ties in with Amir Khan’s aims with ThinkMarkets to secure employment in the City for 100 young people from disadvantaged families by 2022. Amir Khan said: “My ‘Ring the Changes’ initiative with ThinkMarkets WILL have an impact on youth crime and disenfranchisement and make a real difference. “I’m focused on training for my fight against Terence Crawford in a few days but it’s tragic seeing the increasing devastation families are facing as young people are being killed or maimed in knife attacks. Alison Pask, Managing Director, Financial Capability and Community Outreach at The London Institute of Banking & Finance added: “The Ring the Changes campaign helps young people combine the advantages of sports and financial knowledge to develop their skills and confidence. “Over 70% of young people regularly worry about money and want to learn more. The role that initiatives like this can play in building financial resilience is critical. But more than that, initiatives like these can help open doors to career opportunities – and there are lots of those in the finance sector. Khan has a long history of helping charitable causes around the world and set up his own Foundation in 2014, something that attracted ThinkMarkets to working with the former Olympic silver medalist. Nauman Anees, Co-founder of ThinkMarkets, said: “We wanted to take our time to get the right partnerships in place and have worked closely with Amir Khan before securing the London Institute of Banking & Finance and Youth Employment UK. ThinkMarkets aims to teach youngsters the importance of mental discipline and provide them with key skills to help them achieve their goals. Khan’s partnership with ThinkMarkets is the first of its kind, with ThinkMarkets becoming the first UK broker to sponsor a professional boxer. Earlier this year, ThinkMarkets announced another sporting partnership, with legendary Australian fast bowler Glenn McGrath supporting young people in Australia and the UK. 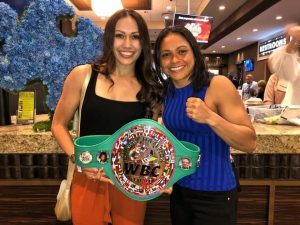 This past weekend was one stacked with Women in Boxing no doubt! The World Boxing Council, WBC Cares program with Chairperson, Jill Diamond, WBC President, Mauricio Sulaiman and the entire WBC Family are very grateful to our WBC Champs, Seniesa “Superbad” Estrada and “Bang Bang” Louisa Hawton who donated their time Saturday evening to raise money for Autism Awareness. With World Champions in attendance like MLB World Series Champ, Scott Erickson, Former Dallas Cowboys, and NFL Superbowl XXVI MVP, Mark Rypien along with many other celebrities, it was a fun filled night where the Champs played, laughed and rewarded the winners of the table that knocked them out with WBC Medals! April is Autism Awareness Month and we at the World Boxing Council are honored Pam Phillips and the Gemini Family have invited us to be a part of this event another year! The difference begins within each one of us. Let’s spread awareness just like our Champs Seniesa and Lulu! Preparations are well underway as Central New York prepares to host boxing’s biggest weekend of the year, International Boxing Hall of Fame Weekend. Star Boxing, in partnership with Turning Stone Resort Casino, today announced a new event for an already impressive boxing weekend – Zab “Super” Judah (44-9, 30 KOs) vs. Cletus “Hebrew Hammer” Seldin (23-1, 19 KOs). The fight will take place in the Turning Stone Event Center on Friday, June 7, 2019, as part of the 30th Anniversary of Boxing Hall of Fame Weekend. The evening’s co-main event will feature James “Buddy” McGirt Jr. (27-3-1, 14KO’s) facing off against David Papot (22-0, 3KO’s), the same weekend his father James “Buddy” McGirt Sr. will be inducted into the Boxing Hall of Fame. Boxing fans will also have an opportunity to mingle with some of the biggest names in boxing, including boxing VIPs and Hall of Famers. Turning Stone will offer a unique boxing fan experience for guests who purchase tickets for the June 7thJudah vs. Seldin fight. For $50 (plus the purchase of a ticket), guests will receive access to the Boxing Hall of Fame Lounge, where boxing VIPs will be socializing throughout the night. Tickets for Judah vs. Seldin are now available at the Turning Stone Box Office in person or by calling 315.361.7469 and 12:00 p.m. online at Ticketmaster. Prices start at only $35, with ringside seats available for $89 and $75. June 7th’s main event features, Zab “Super” Judah (Brooklyn, NY), a six-time world champion, and the last undisputed welterweight champion of the world. The three-time New York Golden Glove champion made his professional debut at the age of 18, later holding world titles in three weight classes, capped off by his undisputed welterweight reign. Judah has defeated some of the most notable names in the business, including, Micky Ward, Lucas Matthysse and Cory Spinks (Undisputed Welterweight Title), and fought many other top fighters including Floyd Mayweather, Amir Khan, Danny Garcia and Miguel Cotto . Opposing the six-time and former undisputed champion will be New York’s feared knockout artist, Cletus “The Hebrew Hammer” Seldin (Shirley, NY). Born from a tough line of Jewish-Americans, Seldin won the Ringside Amateur World Championship in 2009. As a professional, Seldin created buzz throughout New York as a knockout artist packing the Paramount with his “Hamma Head” fans. He broke on to the national scene when he devoured Roberto Ortiz at the Nassau Coliseum in a featured HBO fight. One month later, Seldin became the first boxer alongside Hall of Fame world champions, Mike Tyson and Roy Jones Jr. to fight in featured fights on back to back months on HBO. 83 percent of Seldin’s wins have come via knockout. The veteran craftsmanship of former undisputed champion Judah, will have to weather the storm of the heavy-handed New York brawler in Seldin. On the biggest weekend in boxing, with many Hall of Famer’s in attendance, #JudahSeldin is bound to set off fireworks at Turning Stone on June 7th. In the co-feature bout, James “Buddy” McGirt Jr. (Vero Beach, FL) will look to tip his hat to his father, James McGirt Sr. who is being inducted into the International Boxing Hall of Fame during the same weekend, when he takes on tough Frenchman David Papot (Saint-Nazaire, France). McGirt compiled an impressive amateur record of 44-4 winning the Sunshine State Games and the Southeastern Regional. As a professional McGirt has also found success and has faced some well-regarded fighters in his division, including, Carlos De Leon Jr., Edwin Rodriguez, and Raymond Joval. His opponent, undefeated Frenchman David Papot is taking the trip across the Atlantic Ocean with intentions of ruining the McGirt family weekend. Papot had 102 amateur bouts, 30 of which were with the French National team, earning French National Champion honors two times. In 2017 Papot earned the WBA Continental Middleweight Title, and later that year became the French National Super Welterweight Champion, having since defended the title three times. The undefeated pound-for-pound king, three-division world champion and reigning WBO welterweight champion Terence “Bud” Crawford will headline the inaugural Top Rank on ESPN pay-per-view broadcast against former unified super lightweight world champion Amir “King” Khan Saturday, April 20 at 9 p.m. ET/6 p.m. PT from Madison Square Garden. Crawford vs. Khan will be available via all major cable and satellite providers with a suggested retail price of $59.95 (SD) or $69.95 (HD). All undercard bouts will air live on ESPN2 and ESPN Deportes, beginning at 6 p.m. ET/3 p.m. PT. Crawford (34-0, 25 KOs), the fighting pride of Omaha, Nebraska, unified all four super lightweight titles in August 2017 and moved up to the welterweight division intent on doing the same. In June 2018, he won the WBO welterweight title with a dominant ninth-round stoppage over Manny Pacquiao conqueror Jeff “The Hornet” Horn. Four months later, in front of a packed hometown house at the CHI Health Center Omaha, he stopped bitter rival Jose Benavidez Jr. in the 12th round. Khan (33-4, 20 KOs), who captured an Olympic silver medal in 2004 for Great Britain at the age of 17, has long been one of boxing’s most captivating performers. He won his first world title in 2009 and has victories over Marco Antonio Barrera, Zab Judah, Marcos Maidana, Paulie Malignaggi, Luis Collazo and Devon Alexander. He is undefeated as a welterweight and is once again attempting to prove his greatness against boxing’s best. • Lightweight sensation Teofimo Lopez (12-0, 10 KOs) will face former world title challenger and two-time European lightweight champion Edis Tatli (31-2, 10 KOs) in a 12-round co-feature. Lopez is ranked in the top five by all four major sanctioning organizations and is coming off a savage seventh-round knockout over Diego Magdaleno. • In the other co-feature attraction, Shakur Stevenson (10-0, 6 KOs), the 21-year-old featherweight phenom who earned a silver medal for the United States at the 2016 Rio Olympics, will face former world title challenger Christopher “Pitufo” Diaz (24-1, 16 KOs) in a 10-rounder. • Felix “El Diamante” Verdejo (24-1, 16 KOs), one of Puerto Rico’s most popular fistic attractions, will fight former interim world champion Bryan Vasquez (37-3, 20 KOs) in a 10-round lightweight duel with potential world title implications. The ACBHOF is pleased to announce the opening of its Legends Café during their 3rd Annual Celebration and Induction Weekend. For the third year, the Claridge A Radisson Hotel will serve as ACBHOF’s partner and backdrop for this historic event to be held June 21 – 23, 2019. On Friday, June 21st the ACBHOF VIP Cocktail Reception will kick-off the weekend with the opening of the Legends Café and a special screening of the movie “ME WHEE” — a 30-minute documentary of Muhammad Ali. “It is with tremendous pride that The Claridge-A Radisson Hotel welcomes The Atlantic City Boxing Hall of Fame during this induction weekend. We are privileged to join in this partnership, a blending of the rich history that we both share here in Atlantic City. The Legends Café is an extraordinary, unique, and unforgettable opportunity for immersion into the legendary world of boxing that has evolved in this city over the years.” – A. Cem Erenler V.P. Operations & Development. On Saturday, June 22nd the ACBHOF will invite boxing enthusiasts to join us for conversation and coffee in the Legends Café where an engaging panel discussion will take place. The panel will be moderated and activated with a panel comprised of top boxing historians from New Jersey and Pennsylvania. The Café will host exciting exhibits and art on display by Patrick Killiam from Newport, Wales, and other talented artists and Exhibits that will be on display: Jack Johnson, Joe Frazier Legacy Exists, Deborah King, James O’Neal Sculptures, Boxing Apocalypse and the SparBar. Also, on Saturday the ACBHOF will be inside the Orange Loop for good food and music at the Tennessee Avenue Beer Hall; where guests and fans alike will be interacting up close and personal with boxing legends on hand for autographs and photo opportunities. “Our mission is to honor, preserve and celebrate the excellence of Atlantic City’s rich Boxing History and there’s no better place to highlight this tradition than at the historic Claridge-A Radisson Hotel. My team and I are excited about this collaboration.” – Ray McCline President of Atlantic City Boxing Hall of Fame. The weekend will culminate with the Induction Ceremony on Sunday, June 23rd where the ACBHOF Class of 2019 will be enshrined into the hall of fame history. The Class of 2019 Participants: Bernard Hopkins, Tim Witherspoon, Iran Barkley, Roberto Duran, Micky Ward, Kevin Watts, John Brown, Virgil Hill, Butch Lewis, English Bouie Fisher, Ace Marotta, Jimmy Binns, Sr., Stan Hoffman, Nigel Collins, Henry Hascup, Tom Kaczmarek, Tony Orlando Jr., and Rhonda Utley-Herring.